Bronzeville/Little Tokyo's overcrowded conditions gave rise to a number of health problems, particularly the spread of venereal diseases and tuberculosis. To combat the acute health problems, various organizations and city offices offered free lectures and services. The Southeast District Health Association formed a Special Committee on Venereal Diseases in September 1942 and held a number of educational movie showings and blood testing. Their first meeting was held on Sept. 4, 1942, in conjunction with the Brotherhood of Dining Car Waiters. Another meeting was held in October, specifically targeting war workers. Newspapers such as the California Eagle assisted by publishing educational cartoons on venereal diseases. 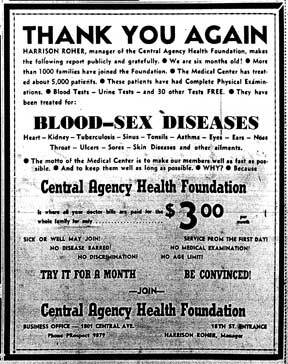 It was common to see advertisement catering to those with gonorrhea, syphilis or tuberculosis. The East Area Health Program held a June 1943 meeting to combat the rising tuberculosis problem. In an Aug. 10, 1943 mayor's meeting report, Dr. George Uhl, Los Angeles City Health officer, stated that in Bronzeville/Little Tokyo “much tuberculosis and venereal diseases discovered” and that they had two public health nurses and two sanitary inspectors assigned to the area. Uhl also noted that the city health officer had written up more than 140 eviction and abatement notices in the area so that substandard living conditions could be cleaned up. In 1944, the Southeast Area Community Health Association launched a $35,000 "Stop Disease” fund drive to prevent the spread of infectious diseases in the southeast part of Los Angeles. Pioneering African American businessman William Nickerson, president of the Golden State Insurance Company, was one of the first to donate and gave $1,000. The association targeted diphtheria, small pox, syphilis, gonorrhea and tuberculosis. From March 31-April 3, 1944, Bronzeville/Little Tokyo residents could get free blood testing and view an educational movie at the Bronzeville Arcade, 316 East First Street. The clinic was offered through a joint venture between the Los Angeles Health Department; Dr. George Hill Hodel, chief of staff of the First Street Clinic, which was an office in the Nishi Hongwanji Temple; and Dr. Seymour Kaufman, founder of the Bronzeville Medical Center. Kaufman, a white doctor, was one of Bronzeville/Little Tokyo's most popular doctor. He offered 24-hour service from his office on the corner of First and San Pedro streets. Kaufman sometimes contributed medical columns to the California Eagle and was one of the first to financially support Charlotta Bass, California Eagle publisher/editor, for her bid for a city council seat. In 1944, the Bronzeville community had also encouraged Kaufman to run for a Los Angeles County Supervisor's seat.